For a paid app this should be able to import data via barcode... there are free apps that do this... huge disappointment honestly! I rarely rate apps but this one deserves it. I tried about a half-dozen vine database apps on a 40-bottle subset of my wines, and quickly settled on VinoCell as the one I wanted to use, and to enter the full 350-bottle cellar. I have been extremely happy with the filtering and search capabilities, as well as the flexibility of the “show in cellar” function. I have three different storage units, each with different shelf configurations, but it was easy to configure each of them. The database itself provides far more fields, and much greater flexibility, than any one user is likely to need — which makes it likely that it will have whatever subset you are looking for. One recommendation, especially if you have multiple vintages of the same wine, or you care about particular vineyards, is to make sure you are consistent in how you enter the names (including whether you spell out full names or abbreviate). The filtering by named attributes, such as appellation, works very well. The search by name function uses exact match, so inconsistent spelling or word-order can make things hard to search for. Should have read the reviews. App review shows many labels and neatly organized, but you need to take pics of all your bottles or import he labels from an outside source. Not user friendly. The setup to add wine is hard to follow and understand. Got frustrated and just deleted. I have tried several and this is by far my favorite. It’s got a great display, loaded with features and consistently good product support. The developer keeps up with Mac updates. Syncing is easy and works correctly. This is a great app once you learn how to use its functions. There is a learning curve since it will keep track of so many things about each bottle of wine (I only use about 1/4 of the possible features that can be tracked). I use it to track about 400 bottles in 6 racks in 2 cellars. At first I only tracked the bottles by rack, but then I decided to track each bottle by specific location in one rack. Wow!! It’s very easy to do once you learn how and it really helps you keep track of each bottle. 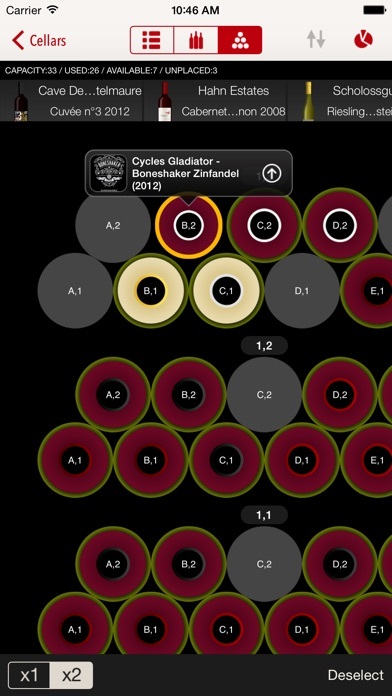 You can select any bottle of wine and it will visually show you where it is on the specific rack. Or you can look by rack and touch any bottle and it will tell you what that bottle of wine is. I now use it to track every bottle on every rack. It also tracks bottles drunk, removed, sold, etc. I haven’t found anything it won’t do. It’s a great app, by far the best wine app I’ve seen to keep track of your cellar(s). I have been using this APP for ten months and have inventoried and managed a large and diverse cellar of wines with over 1400 bottles in stock. I have never lost a bottle and I know where to find the ones that most need to be drunk now. Using the group feature, I can set aside wines for my wife to grab whenever she wants without making a mistake. And, the cloud backup gives me confidence we get it right. Great job! Terrible UX and no camera support! This app has a nice web site and makes it look easy, but the user experience is clumsy and cumbersome. Add to that the lack of camera support to scan labels and I just gave up and requested my refund from Apple! Good app, it is not very intuitive. You have to complete a single task. I think after trying several apps for my 400 bottle cave, this was the best. However, there are two issues that take some getting used to ......defining the cellar structure is not intuitive - takes trial and error. But once you get it you can move along. Also, you should be able to get wine info based on the label picture you take, not require a textual search. That said, it’s feature rich, it works, its in the cloud and syncs so you’re backed up and your significant other is up to date on their phone as well. Look no more, this is the best one. Love it! Need to manually enter info, but easy to use and love the stats! Easy to use. 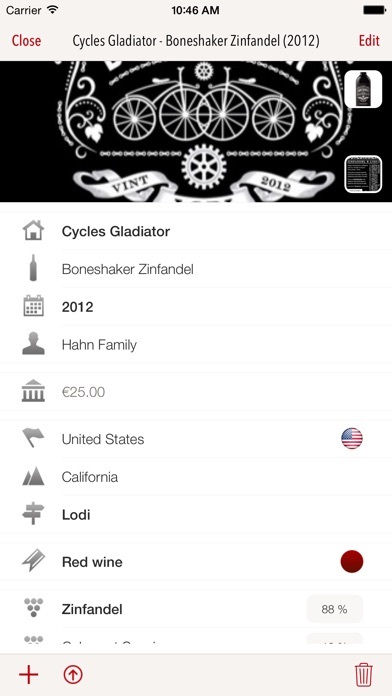 Touches all features of a wine cellar app. Well worth the price. Highly recommend. Great wine inventory and cellar management app! Great app for managing your cellar and worth buying. Uploading to the cloud current inventory has helped me to keep my wines balanced between varietals. One reason for 4 stars is that the lookup function could be better - competitors me delectable seem to find the wine I’m trying to match better. Perhaps they connect to more merchants or a larger database somehow. Once you get everything entered its great. But I’d rather use Cellar Tracker for the simple feature of being able to scan the barcode or label to enter the wine. This app has everything else going for it though. I am using this app over Years now and am completely satisfied with its capabilities. I kept over 1200 bottles of 300 different wines managed and stored in my Vinothek and in Whitewinerefridgerators. My guests can choose at the dinnertable on my Ipad without even running down to the cellar and find the perfect wine they desire! Love it!! I’m not sure why this app is rated so highly. It must be used by people who spend all their time detailing the collection. Cellar tracker, a FREE app, is better than this. You can at least fill in the vineyard automatically, as well as the wine type. This app does none of that, and it costs $9. I want my money back. Great app! Have used multiple wine apps and this is a very good one to manage a cellar. The pictorial representation is fabulous. Would love to see the ability to enter a wine via UPC or photo in the future. Entering wines can be a little slow. But overall very good. Customer service is great too - just email them. I've used several wine cellar apps, even going as far as making my own. This one is the best by far. Very easy to use and holds all the information that I want it to. Had been managing my wine cellar and fridges with a pretty elaborate Excel sheet for 15-20 years. Was missing the mobile aspect and graphic aspect. I had been looking for phone/tablet app for quite some time. This is the one ! Easy to use (entering wine, placing and moving bottles, many search options) and loaded with (optional) rich features. Was able to upload my Excel sheet with minor tweak. Creating the photos for each wine (~130) took 2 ½ hrs, and placing the ~400 bottles took another 2 ½ hrs; the many rack/shelf options covered my various needs. Very impressed by the usability. Hope a Mac Os version is on its way for 2017. Love this app. Was searching for an app to replace a very old PC wine management app. This is exactly (almost) that I was looking for. Web (and other devices) sync/backup. Cellar layout (kind of). And lots of details and stats. Some items I wish were included were an intermediate level when applying the wine source. For example, for a Rutherford AVA wine can only be listed as California for the Region and Rutherford for sub-region. Would much prefer California for Region, Napa Valley for sub-region, and Rutherford for Appellation. Additionally, there are quite a few bugs, but I can deal with them as they do not seem to affect basic navigation and entry of wines. The only "real" beef I have with the app is the bottle location management. It is rather crude, but functional. Having to build many "shelves" tied to a rack (especially when have different sized sections), and then listing the shelves individually instead of a displaying a singular rack, feels cheap & cheezy. I would also like a singular view of the entire wine cellar instead of just the shelf of a rack than can manuever around and zoom in on. I do like this app enough and have learned to adapt to its quirks, that I have moved on from the PC app. The CSV upload via their website is also very handy-even if limited in scope. App is practically useless since search results are difficult to navigate. Spent over 5 minutes trying to find a fairly common wine. Way too many results and still couldn't find it. Spent $10 since no trial app. It was a little tedious to enter all of our wine collection four years ago, but once that was done it was easy to transfer the wine to cases to move them. We knew where every bottle was in our cellar. Now that we had to move we know what wine is in each case in wine storage. Importing the wine making detail sheets is easy and nice to have stored. When we had problems the developer was very responsive. Love this app! Outstanding after watching videos on website along with trial and error. Keeps track of all my wines that I have in wine fridge including what rack and row. Love it. This app has allowed me to track the 150 or so bottles that I have at home. Entering bottles is sufficiently straightforward that I can actually keep the app updated. The ability to sync between phone and tablet adds great utility. We have 2 wine cellars in the house with just over 1000 bottles. The good: Search feature is flexible (sort of fun to "discover" wines I'd forgotten about) Stability of app Cellar design and options Ability to share a dinner wine suggestion with spouse while being away Wine notes and maturity details Flexible wine entry details Search for wine to enter Duplicate feature The less good: Wine entry can be a little slow at first. Seems like there are 1 or 2 too many screens to get it done. But, once you get used to where things are it moves along faster. Recently selected options show up in some of the screens (varietal) but not all. I.e. pain to have to search for US as the country each time. Overalls it's a solid app that does the job well. We now use the app to select a wine and find its location before heading to the cellar saving us from standing in front of the cellar with door open looking at all the bottles and scribbled tags. I'd recommend it to others and hope to use it for many many years. I hope my French was correct, but simply said, this app is the best I've seen and it improves with every upgrade. I won't use anything else. No scan function of the UPC code? Bought the app and thought I could just scan all the bottles real quick. Great utility for tracking wines. Wine cellar setup could be improved but overall, an amazing accomplishment. Finally, a user friendly, full wine storage & info input app. Able to completely control any household wine cellar. Would like to see popular hybrid varietals added to choices. this is one of the best wine cellar apps i have used. easy input, great search options. only thing it is missing is an ability to compare pricing and ratings to latest info available on the internet. a connection to latest details would make it the best. The app doesn't do a lot beyond store what you enter. As far as I can tell, no use of the camera to scan a upc or any attempt to fill in details based on the upc, even though there's a field for it. This is basic functionality that's been in the free web-based applications for years. I probably won't enter any wines since the app doesn't do anything. I don’t know what the other reviewers are talking about, but this app accomplishes so little and makes it so difficult that I wish I hadn’t wasted my ten bucks. It suffers from a terrible user interface and misses on the basics, for instance, it can’t scan barcodes to search for a wine so you have to type everything! The database appears to be quite international, but the majority of my cellar’s contents are California wines and half of what I searched for wasn’t found. My suggestion is just make a spreadsheet with the info you care about and save yourself some money and frustration trying to make this app useful. This is very intuitive and the Database has many wines preloaded. One thing that I would fix is cellar size. I goofed on my wine rack size and after loading wines realized this and you can't change unless you unload all your wines and start over. 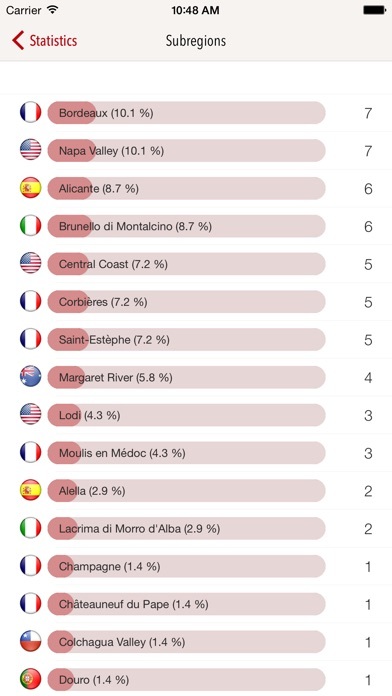 The best app for wine overview.. I have bought 3-4 different apps over the past years. At first I thought this app wanted to do too much, but then afer spending an hour or so, I concluded, this app is perfect whether you want simple overview in a 100 bottle fridge, or you have a massive collection. I can only advice any wine collector to use this app. I must say I was looking forward organizing and adding my wines from the cellar to the app. However I can't believe that each bottle of wine must be entered and typed manually. Other free apps offer scan option, couldn't believe that this app and most expensive doesn't have that option. Need less to say I'm about typing/ entering one by one my inventory. I don’t think there is an competing app that has the same level of functionality, but it also has made this app a bit complicated and confusing. Placing / moving bottles in or around your cellar could be designed more intuitive with a drag & drop interface. i wish the app could give suggested labels pictures for the wines i insert rather than me having to take a picture of every bottle. I would probably pay more for a version that gives the ratings/maturity dates etc. That all said, this is the best one out there. All the features you need and more. You can sort and search by many different methods. Works great. Highly recommend. Can make it as simple or complex as you need to. I either should have read more reviews or asked a question but I assumed that the “best” wine cellar management app would surely and obviously have the ability to use the barcode on a bottle to scan the bottle then match that info with online information so that it fills out the majority of the information......NOPE. More feature than I currently leverage which means I can grow into it. Customer service is excellent and I can edit from any of my devices and it syncs up. Very good. Could be great if it included: 1)bar code scanning; 2) links to pricing information; 3) recording the date for bottles marked as drunk; 4) a more intuitive sorting menu; 5) user-defined custom fields. Developer is highly responsive and open to suggestions. I have used this app for years to track our inventory. We have about 1,200 bottles stored across multiple locations and this app allows us to stay on top of all of them. Yes, the data must be input manually, but I don’t find that to be a significant problem. Once the bottles are input it is actually very easy and intuitive to place them or move them around the cellar. If you have a cellar, this is the beat app hands down. I have looked at many and tried a few. This one is much easier to use and very comprehensive. It has always worked fine for me. Great customer service. This application does not have the capability of searching and adding wines! Not worth the money. All positive reviews are in April! Needs to be updated more frequently. Also need to include more labels. Without the ability to search a wine database or scan a UPC code, this becomes an app that adds little value. Rack design is good --- almost too many choices and you can clearly track a big database in multiple locations, but by the time I enter all the wines, I will have drunk half of them. I have been using this app for almost a year and I have found it to be very useful in recording and categorizing wines for my cellar. There are numerous features and it is very user friendly. I recommend this app very highly. I had to move my wine cooler (180 bottles) and was looking at an App that could not only do the inventory of my bottles but also track the exact location of each bottle. I found it with WinoCell. I am almost done with my total inventory and so happy about it. Now I have to test the tasting part which I am sure is going to be great, and fun! Amongst all the Apps about Wine, I would definitely recommend WinoCell. Not a great app. Especially for $9.00 It has no ability to scan the UPC barcode to enter your wines. Nor does it have many of the wineries and vintages we have in our collection. Cellar Tracker, which is free, does these features. I am very disappointed, after paying for this app. For just beginning to use this app, I have found it to be difficult to navigate. It has been fun learning all this app has to offer. There is nothing I can find fault with! Search feature is not good for Adding wines. Doesn't have subcategory with typical California varietals. Difficult to use. Inefficient, manual and not easy to use. I want my money back. I think the title says it all. For $9, your get to manually enter all of your wines, e.g. No picture to find/scan your wines. Design is far from intuitive to set up. I'm requesting a refund. Very nice app for managing the wines in cellar. 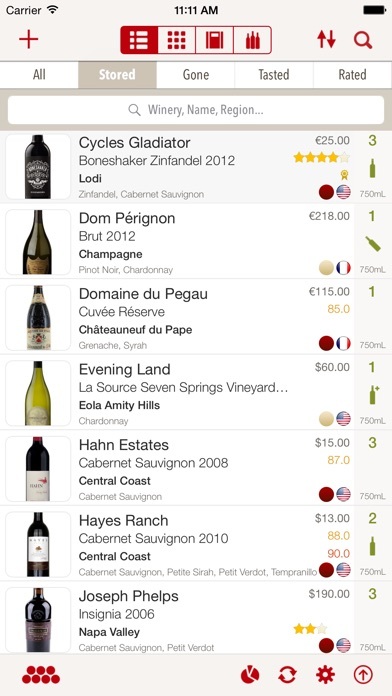 Very helpful when doing wine tastings to purchase and being able to review contents of cellar on mobile device. Very easy to add new wines and database of existing wines very extensive. Also very easy to manage multiple cellars. Overall very good app and highly recommend. Currently have around 1300 wines in multiple cellars and works good. I use this app to keep track of what wine we buy and what we have in our wine fridge. Overall, I'm quite happy with it. It is pretty easy to add a new wine to the list. I'm not a fanatic about all the details, but I do put in the winery, wine name, vintage, price, county/region/subregion, grapes and a picture of the label. It goes pretty fast. The ability to sync between the iPhone and iPad is great. If we see something in a store I can easily check if we've ever tried it, if we liked it, and what we paid for it. You can also copy a wine easily if, for example, you have a new vintage of an existing wine. It gets 4 stars instead of 5 because if you mark a bottle as having been drunk by mistake there's no way to undo it and restore the bottle to your stockpile. Also the interface for placing bottles on racks is funky and confusing. I really don't care to go into that level of OCD, so I simply skip it. Great visual app for tracking cellar location. The Best Cellar or wine Closet tracker on the market!!! I have been using this inventory and wine tasting app for about a year-it's great! I have had no problems with the many features or the general use. My cellar is about 350 bottles of 200 different wineries and I use it daily at home and at remote locations to verify my past purchases and likes. The app shares and sync easily on my iPad, iPhone and wife's Apple Pro. I highly recommend this! Super clunky and unintuitive app. Not sure why all the great reviews unless it was friends and family. Adding and then moving the wines to the respective shelves is a nightmarish task. So clunky. 40 minutes in and I have added 9 bottles and moved 5 of them. Going to mark the $9 as a charitable donation and move on. Phenomenal tracking, enter each bottle in seconds, syncs with the cloud effortlessly across multiple devices. Great !! Punishingly intricate but worth it! If you already have a Cellar, back logging wines takes time, be patient, the end result it worth it! My recommendation for VinoCell would be to create a label database, getting labels for the wine photos is a little time consuming and archaic. Other then that, for the price, it can’t be beat! Love this app! It helps to organize all of your wines. You can enter as much info on each wine as you like - the more data you enter, the more search options you will have. I highly recommend that you enter the grape percentages of each wine, the region, sub region and year as well as the winery. The app developers are great too. I could not find a particular grape that was in one of my wines. I sent them an email and had a response within hours and the grape was entered into the database. We just installed our first 1k cellar and this app is great for adding, tracking, stats. Only request is to add the Vivino type label scanner via picture would make it smoother to add. This app is not for the faint of heart. It has a fair learning curve. But “oh the power!” Once you get into the nuts and bolts of the app it is incredibly comprehensive. A must for the serious wine collector. It is in fact so good I am seriously considering inserting the previous 2000+ review I have on notebooks prior to my app purchase to enhance my wine collecting experience. Started using this app after my previous app, Vinoteka, stopped updating their app. 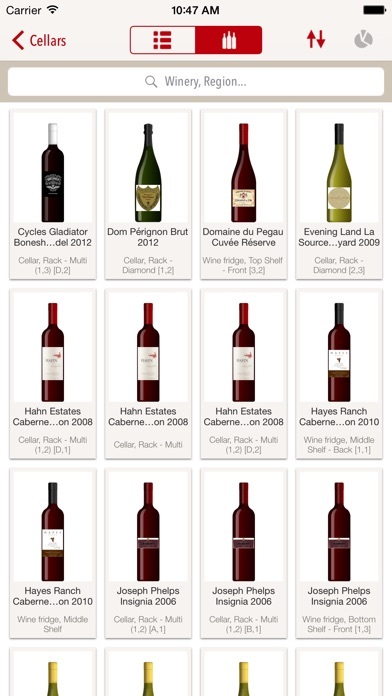 It is a really easy app to navigate and record data about my wine collection of 900+ bottles. I have tried several apps. I found this one the most complete, specially if you want to manage a cellar. Recommended.